Sonos revamps its multiroom system | What Hi-Fi? Delivering 55w per channel, the £349 ZP120 is described as the company's smallest, lightest and most powerful amplified ZonePlayer yet. 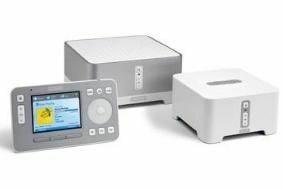 Its fanless design means it operates silently, and like the £249 ZP90 it works on an upgraded version of the company's SonosNet wireless mesh technology. SonosNet 2.0 is also back-compatible with existing ZonePlayer models. The two ZonePlayers are available together with the CR100 wireless controller in the £699 BU150 bundle, which like the individual components goes on sale today. Also new for the system is Sonos System Software 2.6, which is also available as a one-button download for all existing Sonos systems. The new software allows up to 65,000 tracks to be accessed from local servers, supports NASBasic firmware to allow over 15 brands of NAS devices to be used as a local music source, and operates with Apple Mac OS X Leopard. In addition it comes with free access to three DRM-free albums from Classical.com, 50 DRM-free downloads and one audio book from eMusic, and ten full concerts from LiveDownloads.com. That's a package worth a total of £100. Want to know what we think of the new Sonos BU150 system? Click here for our exclusive online review.